Everyone loves a high pressure shower, but did you know that high pressure can be costing you money? Has someone suggested you need to install a PRV and you have no idea what it is? 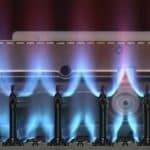 This article will explain why you should have one, how to check if you need one, and explain what it does to keep your plumbing in working order. If we don’t answer all your questions we are always just a phone call away. Testing your water pressure is easy! Code requires that residential homes maintain water pressures below 80 pounds per square inch (psi). The average pressure from water companies in the Upstate vary from 80-130 psi. When water pressures are above 80 psi it may cause leaks and premature repairs. It shortens the lifespan of fixtures, appliances, and the piping of your plumbing system. Most newer homes have a pressure regulating device, sometimes called a pressure reducing valve, and commonly known as a PRV, to prevent damage due to high water pressure. Older homes were often built without a PRV when water pressures from water departments tended to be lower. If your home does not have a PRV or has one that has failed, your plumbing is being subjected to excess wear and tear. WHY IS HIGH WATER PRESSURE DANGEROUS? Flowing water carved the Grand Canyon, and it also carves away the walls of your pipes in the same manner. When a plumbing system is properly designed, water flows through the pipes in a controlled manner. When water pressure is high the water moves through the pipes at a higher velocity than necessary. This higher rate of speed causes the pipes to erode much faster than when water moves through the pipes at the proper velocity. You can’t see this process happening, but other effects of high water pressure are more visible. When you close a faucet or an automatic valve like those commonly found in ice makers, washing machines, and toilet fill valves shut off you are slamming a door on the water flowing through the pipes. Those doors are engineered for holding back water at pressures of 80 psi and under. When subjected to pressure in excess of 80 psi they get stressed out and fail. I liken normal water pressure to a 5 year old kid and high water pressure to an NFL defensive lineman. Most grown people can easily stop a charging child, but almost nobody can stop a 330 pound lineman, even if they were only standing in front of you and just decided to lean in your direction. Your fixtures can handle what they are designed for, which in this example would be a typical adult, but if you ask them to stop and hold back more, they will bend and eventually break. Items that may have a normal useful life of 7-10 years, may last 1-3 years at best under excessive pressure. If you have a newer faucet that is dripping, a toilet that runs non-stop or requires repairs every couple of years, or other leaky device you may have a water pressure issue. High water pressure can also cause banging pipes and whistling noises throughout the home. As that big lineman runs through the piping system and eventually runs into a brick wall in the form of a closed valve, all that momentum stops in its tracks. This can cause the entire length of pipe to slide if it isn’t well secured. It is most prone near fast closing automatic valves like the ones found in washing machines, ice makers, and toilets. If you hear banging noises, it is a very good indication that you have high water pressure. 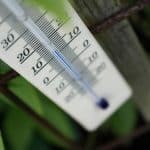 If you think you have high water pressure, or just want to be certain that your pressure is normal, all you need is a simple pressure gauge with a garden hose connection on the end of it. You can find them at a quality hardware store, one of the big box centers. Prices range from about $10-$20 and they will tell you everything you need to know. 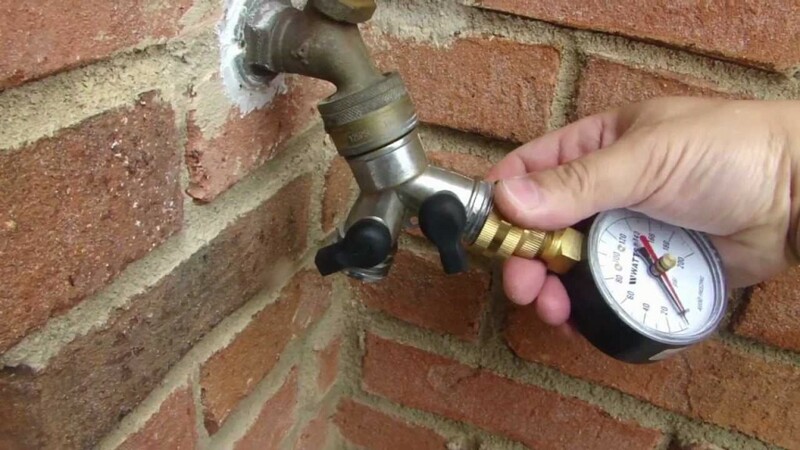 Once you have a gauge simply connect it to your garden hose valve in the backyard, side of the home, or your water heater drain valve and turn it open. 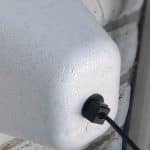 The hose bib on the front of the house is not recommended as a testing point because many PRVs are installed on the system just after the front hose bib. When this is the case you can get a false positive for high water pressure when the house may still be under protection. The needle on the gauge will move up and settle after a few moments telling you what the standing psi of your plumbing system is. It is important to let the pressure level off before you think you are in the clear. A failing PRV will often cause a gauge to start out under 80 psi, but the needle may begin to slowly climb. When a PRV is not present the pressure may fluctuate throughout the day as the water company experiences changes in demand. Gauges like the one show above have a second needle that will show you where the water pressure peaks while you leave it connected overnight. 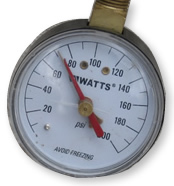 This type of gauge may also record another pressure issue known as thermal expansion which you can read more about in our next article. When the pressure entering your home is high, you can correct it by installing aPressure Reducing Valve commonly referred to as a PRV. A PRV takes the high pressure entering your home and suppresses it down under 80 psi. Most are adjustable and can be set anywhere from 40-80 psi. 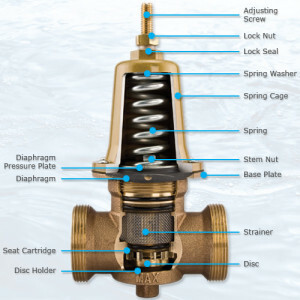 Water is constricted within the valve body and directed through an inner chamber where an adjustable spring loaded diaphragm and disc adjust continuously to maintain the preset pressure. Even if the supply water pressure fluctuates, the pressure reducing valve ensures a constant flow of water at a functional pressure. They can be installed just after the water meter, or just after entering the home. Anything beyond a PRV will be protected from high pressure as long as the valve remains functioning. A good quality PRV has a similar lifespan as a tank style water heater. You can expect 7-12 years as the typical age before failure. If you have a home built prior to 1996 or you know that your PRV is over 12 years of age, it is recommended that you verify its operation. A reputable plumber will have a pressure gauge and will always check your water pressure before attempting to diagnose any of your plumbing issues. 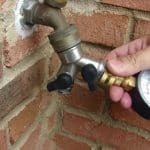 If you are worried about lowering your water pressure, keep in mind that most people can’t actually tell the difference between 70 and 120 psi. If you have any questions give us a call or leave a comment below.